Carved by glaciers, Norway’s fjords are the ultimate reminder that God has created infinite shades of green and blue. Waterfall after waterfall cascade from sheer, snow-covered mountain tops. Some falls almost seem to dance down the mountain in a delicate cascade while others thunder deliberately down from the cliffs. 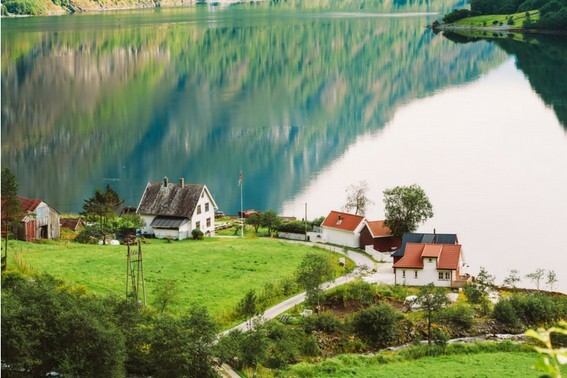 Charming fjord-side villages made up of farm houses in shades of brick red, mustard yellow, and stark white pop against emerald, grass, hunter, fern, and countless other unnamed shades of green. Fjord country is most certainly the Norway of your dreams. If your family is visiting Norway for the first time, I highly recommend the Sogneford in a Nutshell Tour package. Sogneford is the longest fjord in all of Norway (and second in the world only to Scoresby Sund in Greenland) and certainly one of the most scenic places on the planet. “Sogneford in a Nutshell” takes you from Oslo to Bergen (or vice versa) with train and boat transportation along the way. This “tour” does not include a guide; it is basically a transportation package that allows you to see the region in comfortable fashion and add lodging and activities as desired. While it is possible to do the entire tour in one day, I beg and plead for you to spend at least 2 nights in fjord country. Rushing through Sognefjord with the masses really takes from the serenity that this natural wonderland can provide. My family’s adventure into fjord country began with a train ride from Oslo to Myrdal, the home of the famous Flam Railway. The train ride was quite scenic, taking us past charming towns with towering church spires, red farm houses and sod roof barns, expansive evergreen forests, vast blue lakes, and brilliant wildflowers in shades of purple, pink, yellow, and cream. As we climbed in elevation, snow fields and desolate lakes lined with scrubby, budding trees dominated the landscape. Though it was late June, the weather at the Myrdal station was reminiscent of winter. Snow patches still lingered on the ground and dense clouds kept things windy, misty, and bone chilling. When we hopped out of our train for our transfer to the Flam Railway, temperatures hovered in the high 40’s. Though we only had to step across the platform to board the next train, we did have a 30-minute wait in between and were not quite prepared for the weather; I suggest having something warm tucked in the outside of your luggage for the wait. We joined several other tourists crammed into the tiny Myrdal station until our train was due to arrive. We knew that we wanted a seat on the left side of the train so we were sure to head back out into the cold a couple minutes early to snag a good seat. The ride down the steep grade towards Flam includes 20 tunnels, one bridge, and lots of photo-worthy scenery along the way. 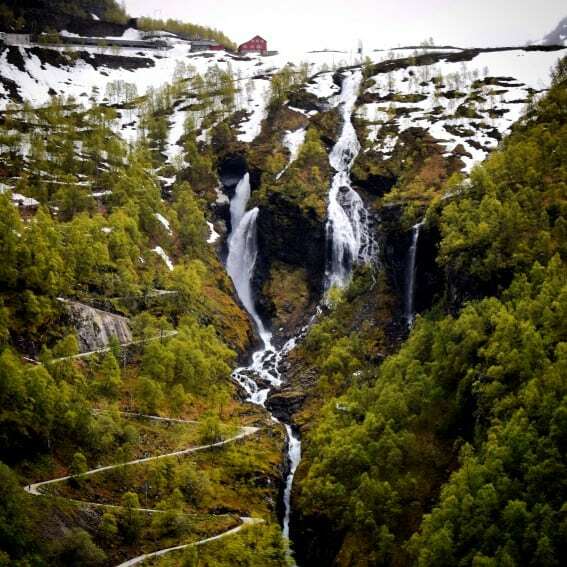 One of the major highlights is the stop at the Kjosfossen waterfall where a Huldra- a seductive forest spirit from Scandinavian folklore- dances and sings in front of the raging waterfall to the delight of tourists. During her performance, passengers are able to step out of the train and take pictures from the viewing platform. 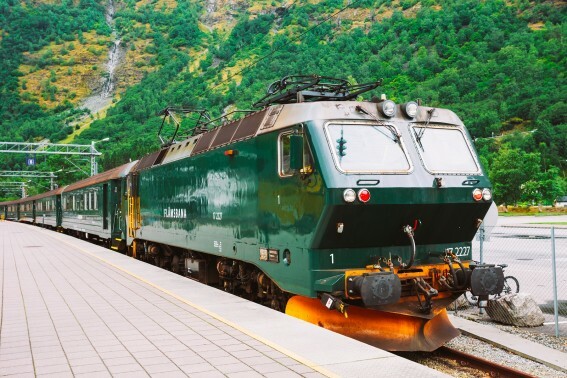 Our train chugged down the mountain until reaching the end of the line in Flam, where our adventure in Norway’s fjord country with kids was set to begin. Situated at the end of Aurlandsfjord, a branch of the mighty Sogneford, Flam is a tiny village dominated by the cruise ship industry. The hamlet is home to merely 350 permanent residents but during the high season 45,000 tourists keep things bustling. Flam Harbor is dotted with a few duty-free shops filled with all sorts of irresistible Norwegian goods – think jackets, sweaters, and scarves- making them prime spots for souvenir shopping. There are stands where families can rent bikes and kayaks to explore the area. Dining is limited to just a couple small restaurants, including a cafeteria across from Dock 2 which sells some surprisingly tasty pizza. Over 150 cruise ships pull in to tiny Flam Harbor and when one is in port it certainly changes the vibe of this otherwise sleepy little spot. Instead of hopping on a ferry with the masses, my family opted to spend the night at the Fretheim Hotel which sits near the waterfront. Besides mastering the art of “location, location, location”, the Fretheim also exudes charm while complimenting the region’s natural beauty. The biggest perk of staying at the Fretheim is the ability to watch the cruise ships and ferries pull out of port and suddenly feel like you have Flam pretty much to yourselves. 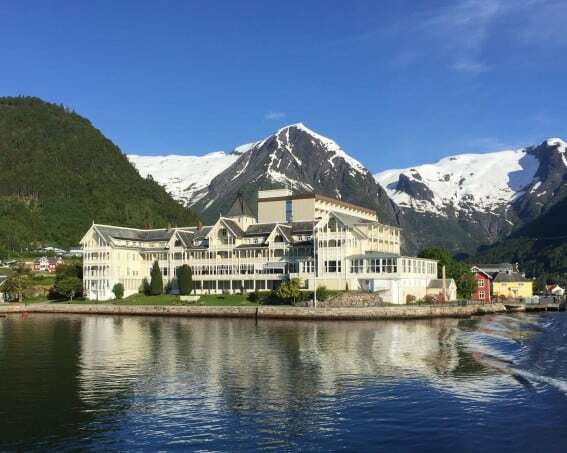 Be sure to take time to hike in the hills above the hotel and take in views of the fjord as well as the lovely waterfall cascading behind the village. Tip: Many Norwegian hotels allow guests to pack lunches from the breakfast table for a fee or will put together a sack lunch for their guests. Norwegian breakfasts are quite extensive and include items such as cold cuts, that many US residents are used to having for lunch. Packing a lunch is a great option while exploring fjord country, especially since dining options can be quite limited. 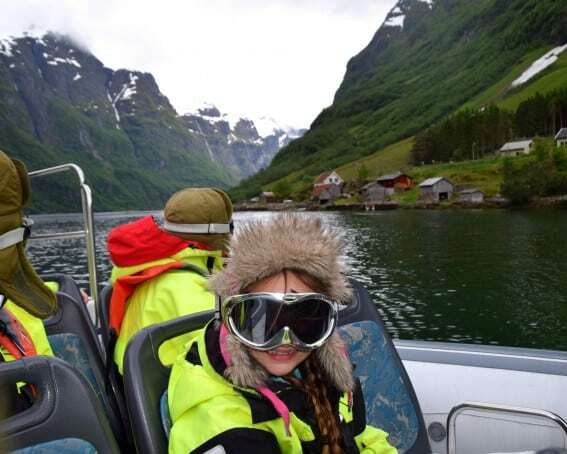 The true highlight of my family’s Norwegian vacation was our Heritage Fjord Safari with Flam Guide Service. We put on the provided gloves, jumpsuits, hats, and goggles and hopped on board the RIB boat. We all had a blast zipping through the fjord, searching for seals and porpoises while sailing over giggle-induced wakes from ferries. 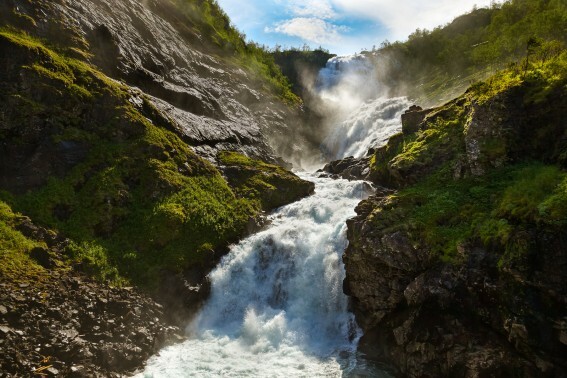 Our fjord safari was finite proof that there is no such thing as too many waterfalls. We saw countless falls during our tour and it was quite thrilling to ride the RIB boat right up to the base of thunderous falls plummeting into the fjord. 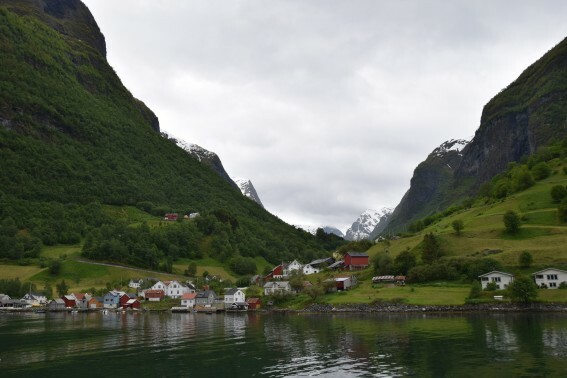 As we cruised towards Nærøyfjord, arm of Sognefjord a designated UNESCO World Heritage Site, we learned a bit about the history of the people who have been calling the fjords home for generations. Goat herders used both sides of the fjord for grazing and left their teenage daughters on the other side to tend to the goats as well as keep them away from the boys. Jonathon, our guide, told us a tale of a troll disguised as a vixen to keep the boys away from the girls tending to goats on the other side of the fjord. “Did it work?” my daughter asked. “Well the Norwegian people are all still here so I am going to guess no,” he replied with a mischievous smile. Goats continue to be an important part of life in tiny Undredal, which is renowned for its goat cheese and a popular spot to stop for tastings. Think About It: Consider the life of a water droplet in a Norwegian fjord. It begins in a solid form fluttering down from a moody cloud in the form of an ice crystal and sits atop a mountain amidst billion of other droplets forming a blanket of snow. It sits there silently, piled on by its brethren forming a solid white top hat for a dramatic peak. Eventually spring arrives, later than in most parts, and the warmth of the sun forces that little ice crystal into liquid motion. 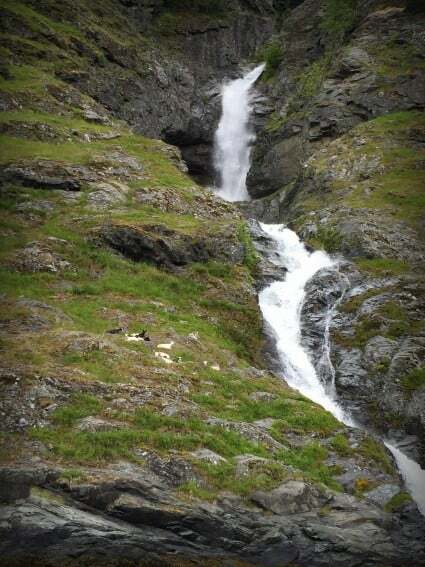 It drips its way from stream to a river before it makes a dramatic plunge off a sheer cliff into the frigid brackish waters below, crashing into a deep water way carved out by glaciers centuries ago. Balestrand looks like a scene from a fairy tale, and that’s because it actually is! This picture-perfect little waterfront village, framed with brilliantly green snow-capped peaks, served as the inspiration for Arendelle in Disney’s Frozen. St. Olaf’s Church, a charming little chapel perched between the fjord and the mountains, was the inspiration for the chapel where Elsa was crowned queen in the film. 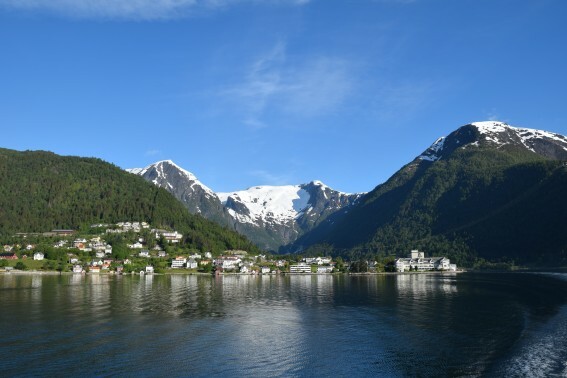 There are several nice hiking options from Balestrand, including hikes up to the snow! A wealth of information and suggested routes can be found at the Balestrand Tourist Office. 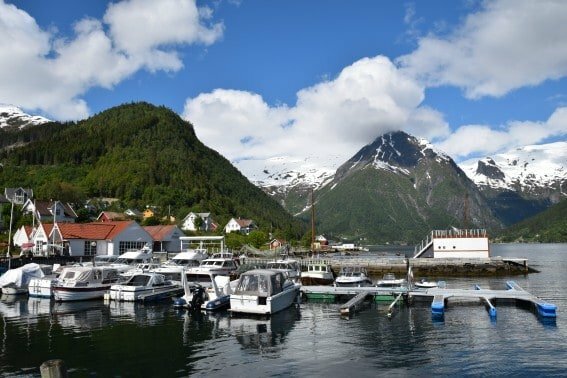 Balestrand is also home of the Sognefjord Aquarium which houses several species of fish living in the fjord and offers canoe rentals. 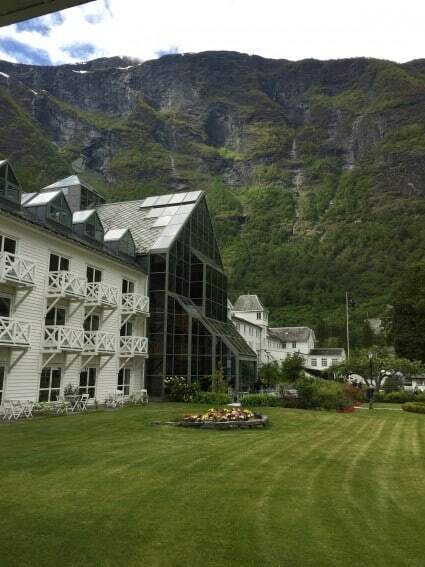 Balestrand may not have a royal castle but it does have the Kvikne’s, a fairy tale hotel with Norwegian wood architecture and Swiss-style influences. If you can only afford to spend one glorious night in fjord country, this is the place to do it. The most prized rooms are those in the original annex of the hotel. They feature antique furnishings and some have private verandas with expansive views of the fjord. It was here that I learned to absorb the beauty of the fjord in all stages of light. Whether I was watching the sun attempt to set after midnight or basking in the pink hues of 4am light reflecting off the snow-capped mountains, I simply couldn’t get enough. I share my love for the Kvike’s Hotel with Kaiser Wilhelm, who spent many holidays in Balestrand. Tip: While waiting for a ferry in Balestrand, our crew met fellow family travelers who recommended the Pilgrim restaurant in town. They described it as part art gallery and part dining establishment and told us that the woman who runs the place loves children and captivates them with wonderful stories. 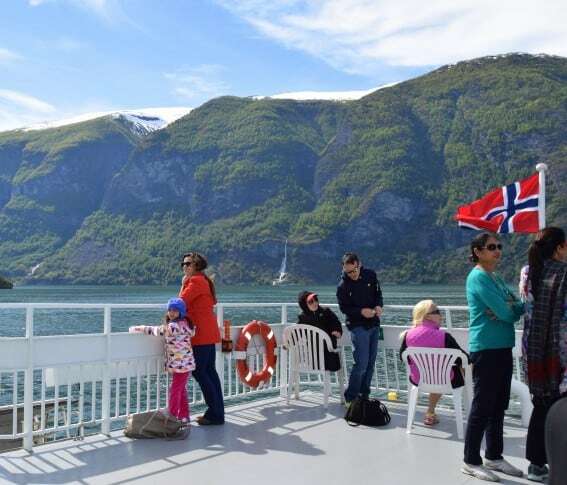 The key to really enjoying the ferry is to avoid boarding during the times that people from the Sognefjord in a Nutshell or Norway in a Nutshell tour would be loading in Flam if they were coming directly from their train ride. This is typically in the mid-afternoon. We opted to take a morning ferry from Balestrand to Bergen and had plenty of space to ourselves. The ferries feature large viewing windows, onboard wifi, and spacious seats that are quite comfortable. While I spent the bulk of my time outside (there is so much to see on this incredibly scenic cruise), my kids opted to spend a good chunk of their time inside, relaxing between adventures and popping out to the viewing deck whenever the captain announced there was a particularly spectacular waterfall to view. Tip: It is best to try to visit Norway’s fjord country in early June or late August, before or after the busy European travel rush. 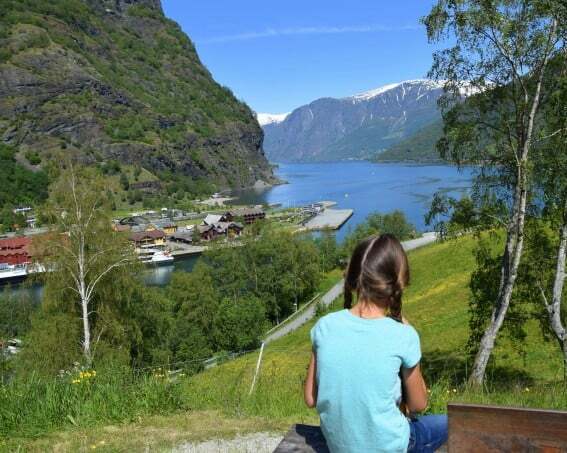 If your family is looking for a fun day trip from Balestrand or Flam, visit Fjaerland’s Glacier Museum before heading out to view a glacier up close. The museum is accessed via ferry from Balestrand. (Don’t make the mistake of getting on the large ferry to Bergen or Flam; this ferry is much smaller. Ask your hotel front desk or the Balestrand Tourist Office for ferry information. Booking your ferry and tour in advance is recommended in the high season.) The museum sits at the entrance to Jostedalsbreen National Park. Nearby Boyabreen Glacier is an easy glacier for kids of all ages to view as it doesn’t require any big hikes. 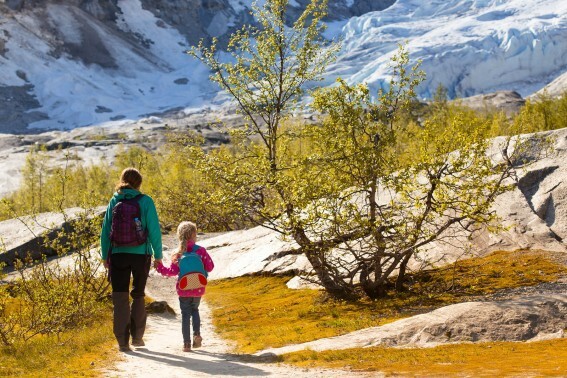 Families with older children should consider taking a guided hike to Nigardsbreen Glacier. Kids as young as 6 hike to the glacier’s edge while families with kids ages 12 and up can actually hike on the glacier. For more information and tips on planning your Norwegian vacation, head to VisitNorway.com. Disclosure: My family toured Norway’s fjord country as guests of Visit Norway in order to provide unbiased coverage for Trekaroo. The Nordic hospitality was greatly appreciated but all opinions are my own.